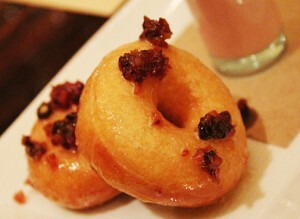 Maple Bacon Donuts at BLT Steak. This Friday, June 6, is National Donut Day! Obviously we love the sweet treats here at Pretty Southern and have a few ideas of how you can celebrate. Over at BLT Steak, Chef Nicholas Alicea and Pastry Chef Sarah Biggard combine their talents for a blackboard menu salute to the donut. The Maple Bacon Donut is crafted from a uniquely blended dough, coated with a maple sugar glaze and topped with crispy thick cut bacon crumbles. If you aren’t able to take advantage of this special on National Donut Day, the Maple Bacon Donut will be making its return to the blackboard menu during Pork Week of the BLT Boucherie Series (Aug. 11 – 17). For more information on the Boucherie Dinner Series and to make reservations, please call (404) 557-7601 or visit BLT’s website. 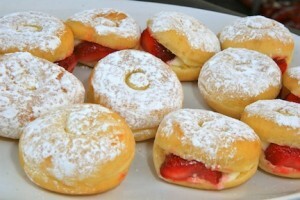 Strawberry and cream donuts from Sublime Donuts. Arguably, the sweetest, fattiest, donuts in the South are over at Sublime Donuts near Georgia Tech in Atlanta’s Westside neighborhood. While promoting their movie “Ride Along” stars Ice Cube and Kevin Hart stopped by Sublime Donuts to serve breakfast to a crowd lined up around the block. With flavors including Chocolate Banana Fritter, Dulce de Leche, Red Velvet Cake, Butter Toffee, and the infamous A-town Mocha, there’s something for every donut lover. While we love Krispy Kreme as much as the next Southerner, Sublime Donuts wins our bakeoff. Our recipe for grilled donuts with ice cream. 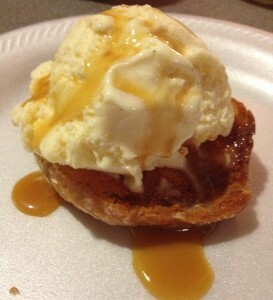 Of course, if you feel like whipping up your own donut treat at home, you can always get brave (albeit a bit gluttonous) and try our recipe for grilled donuts topped with ice cream and caramel sauce. We used Krispy Kreme donuts purchased at our local grocery store for this concoction. If y’all have any other recommendations for delicious donut recipes, please let us know in the comments section below. Happy National Donut Day, ‘Merica!